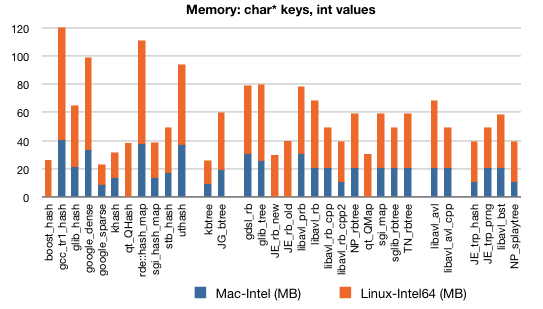 By putting both mac-intel and linux-intel64 in the same column are you attempting to show that the MI are all lower (memory or time) than the LI or showing total of (MI + LI)? Ie, is the blue line in front of the orange, or is the orange standing on top of the blue? 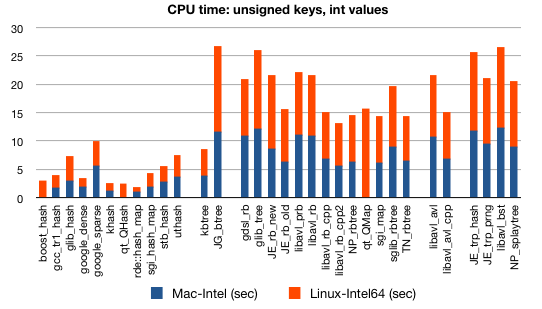 In the above figures, the orange is standing on top of the blue. 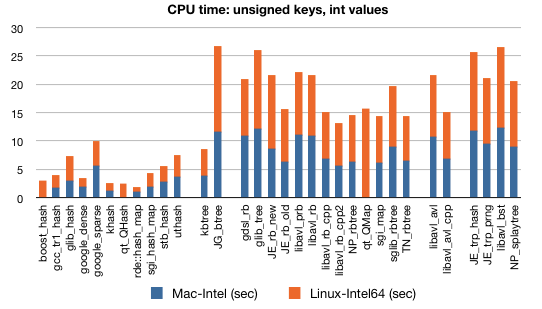 In the first figure, for example, the second bar means google_sparse takes ~6 CPU seconds on Mac while ~4 seconds on Linux. 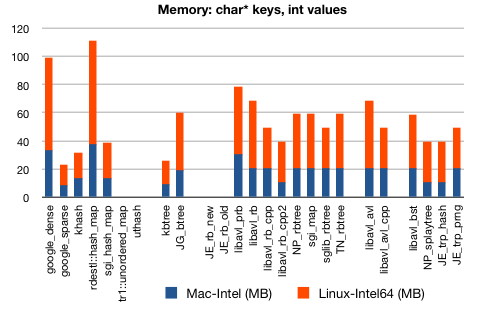 And therefore, each bar represents the overall performance on the two systems with similar CPUs (Mac: 2GHz; Linux: 1.86 GHz). Actually, it would be clearer to put the results in eight, rather than four, charts, but then there would be too many figures. Perhaps I’m blind, but cannot find your mail anywhere. I’ve modified your benchmark to include my hash_map class, would be glad to send my modified version to you. Ah, it is hidden in the source codes. You can send the code to attractivechaos at aol dot co dot uk. Thank you. on October 10, 2008 at 2:36 pm | Reply RDESTL - changes | .mischief.mayhem.soap. The code is pretty fast but not very legible. Single letter variables are a killer. Your focus on these data structures is good, trying to balance speed and size. If something like ustl were actively maintained I do seriously believe kbtree & khash could be worked into it to fill in some of the missing algorithms. Thanks for the comment, Brian. I like the philosophy of uSTL. However, what I am aiming at is to make a even smaller library than uSTL. For example, if we want to use a hash table library, just put a single header khash.h in our code. Then we do not need to worry too much about dependency or portability because all the code is there. To me, it is a bit worrying to ask other programmers to have SGI STL/g++-tr1 or even to install a giant boost/qt for a basic container as simple as hash table. khash.h only has ~300 lines of code. You may get away with that with khash since the standard stl doesn’t have hash_map. However to make the code most accessible by more people it might be nice to have some similar api…it makes it easier to change out libraries if need be. I personally haven’t used hashes in ages since I got burnt so badly by QDict back in the old days. It seems I should perhaps re-evaluate the use of hashes, however I definitely need the ordered behavior of a map class still. It might be interesting to see how the collections you have there fare on an embedded platform like ARM. Thanks, Guillermo. Currently I only include libraries that do not require to install. I will try to include QT/Boost/glib/gdsl and so on when I get time. I have tried gdsl’s red-black tree. It is quite a standard three-pointer implementation using void* for generic programming. Not surprisingly, it has quite similar performance to libavl_prb. For red-black tree library in C, I would recommend NP_rbtree, which is by all means superior to gdsl_rbtree. NP_rbtree is used in FreeBSD’s kernel. It must be very stable, too. GDSL’s hash table only allows char* keys. I did not test that as it is not a generic container. Very interesting article, just what I was looking for, thanks! In the end I decided to go with sgi_hash_map for now, since it already comes with g++-4 and can easily be switched out for a standard STL map (almost identical interface). By the way, have you considered including boost/unordered_map.hpp in your benchmark as well? Thanks for your interest. I have tested QT4 QHash and boost::unordered_map. I commented these two libraries in another post. If I did everything correctly, boost::unordered_map is a little bit slower than SGI’s hash_map, with almost identical memory footprint. 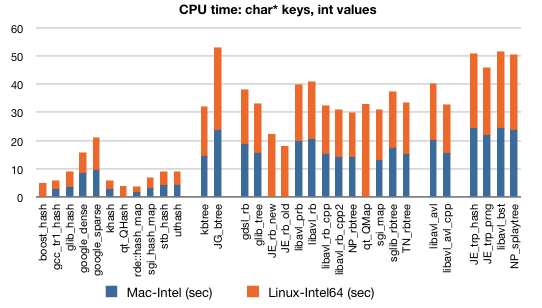 QT4’s QHash is a little bit faster than SGI hash_map but at the cost of more memory. For a C++ user, I would highly recommend SGI’s hash_map. SGI’s STL is widely used with several leading compilers. It has been in gcc since 2.95.3. And therefore its hash_map is highly portable. On performance, it is close to the best. Although in this benchmark sgi_hash_map is slightly slower than my own implementation, I can (carefully) design another benchmark to make my implementation slower. In terms of stability and easiness, hash_map is also better. Boost, gcc’s TR1 and QHash are also good candidates, but then you need users to have gcc4 or to install hundreds MB of libraries for a simple thing as hash table. I am always a bit worrying about this. Thank you for the hint and sorry that I have not read documentation carefully. Uthash now works properly. I will update the post later. I just noticed a (new?) first column “boost_hash”? Which library is that, boost.unordered? It seems to give good performance (with little space) for char* keys, but is only plotted for 64bit? It is boost unordered class. I did not install it on my Mac laptop (it is huge and I am short of disk space) and so the mac result is unavilable. From what I can tell, g++4::tr1/sgi_hash/boost_unordered all use very similar algorithms. It is no surprising that they achive very similar performance. I think it’s interesting to note that the __gnu_cxx::hash_map (from sgi) is considered deprecated as of gcc v4.3 — the gcc tr1 hash containers are preferred replacements. However, their memory performance seems to be terrible in your tests…! I have tested g++::tr1 several times before and only this time it shows this weird memory footprint I could not exlain. I have not looked into the details, though. In general, in all my tests, g++::tr1 is slightly faster than __gnu_cxx::hash_map. It would be good to use g++::tr1 when we make sure this weird memory is not caused by a bug. At least I am not seeing the weird memory pattern with more recent g++. Could you also include the following in your testing? 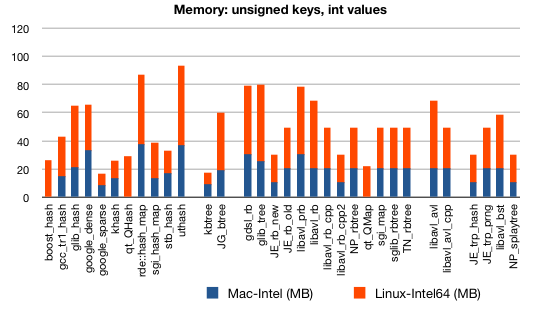 stx-btree is a really good library, outperforming all the other tree-based libraries, including mine. Simply include ‘#include ‘ into your source C file. Include ‘gdsl-config –flags’ to your compilation command. Include ‘gdsl-config –libs’ to your link command. I am using netbeans 6.5 for the development. Please tell me that what could be the problem as i am really stucked in it 😦 also if you could please suggest me some other good IDE for development as the one i am using is good for java but not for C.
Or you explicitly put the output of gdsl-config –flags to replace `gdsl-config –flags`. Maybe you have to do so for windows as windows shell does not recognize this “ marks. What to use is largely subjected to your appetite. I simply use Emacs, but this might be difficult for you. I know people use NetBeans (Java), Eclipse (Java), code::blocks (cross-platform), Dev-C++ (windows), Kdevelopment (Linux/KDE) and Xcode (mac os x). These are all free. I think others rather than me may give you more useful advice. Thank you for the link. STX B+-tree is a very good library. It slightly outperforms my kbtree in terms of speed and comparable in memory. I will show the results later. did you try boost intrusive hashes at all? No, haven’t yet. Is there a link? I’m testing google dense and boost hash library and with the string key (not an int key) the time requiered to find an element in a 300.000 hash size is about to 500 milisecs… anybody has had the same result? I used to have this problem with google-dense: when the number of elements exceeds several million, the performance suddenly decreases dramatically. It seems to me a bug. If you want to use a hash table in C++, I would recommend try tr1. I experience the same if using a simple hash function (e.g. h = h << 5 + *s, or h = 5 * h + *s). If using google-dense with CityHash, the speed will not be the issue again. This is interesting. The inputs are random. I would not expect a hash function can have this big effect. Heres another hash table implementation you might want to check out. It has a few comparisons against khash as well. A few comments, though. Firstly, khash trades speed for memory because at times I need a huge hash table. Khash can be marginally faster if it is purely optimized for speed. Tommyds seems to take much more memory. Secondly, it seems that you are evaluating the performance given “char*” keys. I guess khash will come closer to tommyds given integer keys. 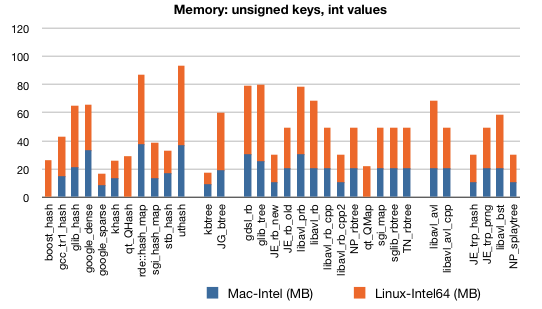 Open addressing hash table seems to have a little worse performance for string keys where comparison and hashing are expensive. Thirdly, khash requires to manually deallocate the memory allocated to the string keys. Just call “free()” before/after you call kh_del(). It is true though that khash does not shrink the table even if it is nearly empty. A question, too: does tommyds, like rdestl and a few others, cache the hashed value? Sorry, don’t know. I’m not the implementer of tommyds, just someone looking around for a decent hash table to use. Btw, you ever consider adding a little more documentation, and maybe changing the code a little to be more readable? I found khash’s usage to be much more difficult then other hash implementations. No, TR1 unordered_map doesn’t use more memory than SGI hash_map. I have run your benchmark and noticed that the string test has stored all 5 million keys including duplicates (which takes exactly the amount of RAM it should). The reason for this is that sadly hash no longer works for const char* in TR1. Cstrings are treated like plain pointers. I mean, how could they do that to all C users? I think we are all supposed to use std::unordered_map with key type std::string, right? Thanks for your nice post. I have learned a lot from your articles and your codes. 1. when using const char* as hash key, have you considered using a better hash function? 2. the latest version of udb http://attractivechaos.awardspace.com/download/udb-latest.tar.bz2 does not compile (missing ext/hash_fun.h for google-dense gcc version 4.6.1 (Ubuntu/Linaro 4.6.1-9ubuntu3) on x86_64). 1. This X31 is largely believed to be one of the best string hash funcions. 2. That may happen. This legacy hash_map as well as the tr1 namespace indeed causes quite a few backward compatibility issues. Fortunately, with C++11, life will become easier (though I barely use C++ these days). Do you have any advice for trying to use khash.hh with a custom allocator or mempool? Very interesting, thanks a lot for doing the benchmark. It’s author also wrote numerous tutorials about the search trees. Thank you for your work! It helped me a lot when I needed to choose a space-efficient data structure for a project of mine. I’d be interested in using your kbtree implementation, provided that I had to port it to C++. Under what license do you allow it to be used?